Edinburgh is dressed in its magical gown. It is covered in Christmas decorations, the Christmas market is on and Santa is just round the corner. Could there be a better time to visit? Well, the seven participants that decided to attend our Intensive Interpreting Practice course certainly didn’t think so. For the first time this year, LINCS has decided to run this course in December. 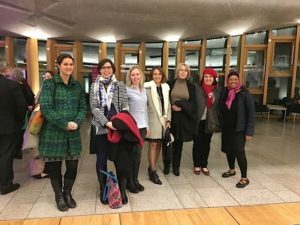 So seven interpreters gathered in Edinburgh from different part of the world (Sweden, Austria, Russia and even Senegal!) to get together and enhance their interpreting skills. Our team of professional lecturers have worked with them all through the week, giving them constructive feedback on their output in English from all their working languages. 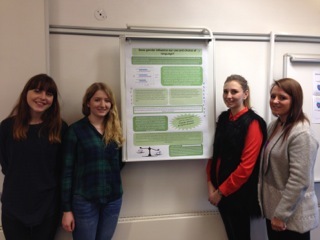 They also received feedback on their Spanish, French and Russian from some lecturers. The week was very stimulating and eventful. 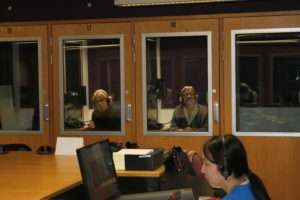 The participants got a chance at practicing Simultaneous and Consecutive Interpreting in our state of the art interpreting labs. They also took the time to do some revision on their note-taking techniques. As part of the course, too mock conferences were organised. The topics were: “Accessing medical care: challenges and issues” and “Economy and environment: friends or foes?” These offered the opportunity to students to practice delivering a speech and put themselves in the role of the speaker but also to interpret from real speeches and from a very lively discussion. To prepare themselves to deliver a speech during these mock conferences, a public speaking session had been organised; because, after all, what is an interpreter if not a public speaker expressing someone else’s ideas? As all the participants were practising interpreters, it was a good opportunity for networking and for sharing different techniques used by interpreters either when they are interpreting or ahead of the interpreting for preparation. 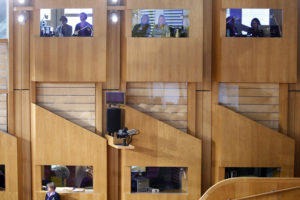 And finally, as Heriot Watt University has a partnership with the Scottish Parliament, the participants spent one afternoon working in a dummy booth. 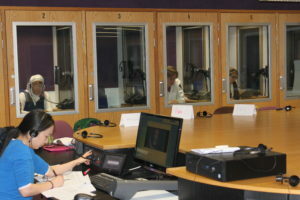 The Scottish Parliament have four interpreting booths that they kindly open to students of Heriot-Watt University for practice. This was an excellent exercise for our participants, as it allowed them to practice interpreting from a wide range of Scottish accents, a form of English to which they are not necessarily accustomed. It was also a great opportunity to witness the making of Scottish politics! All our participants had a great time, enjoyed Edinburgh and the content of the course. On that note, LINCS would like to wish you all a very merry Christmas. How can we define “quality” in interpreting? What does it mean to be a “good interpreter”? Before I answer that, let me tell you a little story. 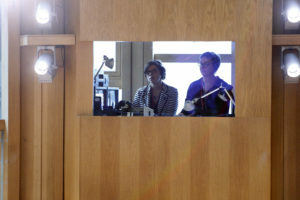 I was doing chuchotage interpreting at a wood industry conference. The first plenary talk was given by an economist. This particular economist crammed as many charts as he could on each slide. Added to this was his love of long, complex numbers. Numbers are hard enough when we are in nice booths and have the chance to take notes in advance. When you are doing chuchotage and you have no advance warning, they are practically impossible. Faced with this task, I decided to concentrate on giving a version that would be useful to the French delegates, even if that meant dropping a few (or more than a few) numbers in the process. I had realised that the purpose of the entire conference was to help people see the economic context they had been in and prepare for the one they were going into. So that’s what I aimed to do in my interpreting. Now, interpreters have almost universally defined “good interpreting” or “quality” in interpreting as being all about interpreting everything the speaker says, getting terminology perfect, and staying totally neutral. So, following that logic, what I did at that wood conference would count as bad interpreting. We can now be pretty sure that the reason for such differences in quality judgments is that clients use different criteria from interpreters when judging quality. In fact, even when interpreters and clients seem to be using the same criteria (such as accuracy), it turns out that they are likely to be using completely different definitions. Now, we could stop at this point, argue that clients are clueless and go on doing what we are already doing. There are two problems with that. The first is that it happens to be clients who are paying our invoices so it is bad manners to call them clueless! The second problem is that, as soon as we assume that we have things right already, we stop learning. A more useful explanation of the difference between how clients see interpreting and how we see it is that we often talk about “quality” in interpreting in a way that separates it from any context. We describe it in terms of reducing errors, creating standards and maximising productivity. In short, the way we often talk about quality treats interpreting as if it were a product and not a service. Clients necessarily view interpreting in terms of the contexts in which they receive it and in terms of what they want to achieve in that context. Instead of neutral, depersonalised “quality”, they view interpreting in terms of the value it adds to them. In short, for them, it is a service and not a product. That knowledge is vital if we are ever going to improve the status of interpreting and stop the relentless drive towards cost-cutting in some circles. For as long as we talk about interpreting as if it were a product that can be described in terms of “quality”, we are actually encouraging clients to look for ways to cut costs and reduce how much they pay for it. If we start talking about interpreting in terms of the value it adds, then we will have a much better platform from which to argue that interpreting is worth investing in. It’s our choice.